30 Minute Limit is the all-new football coupon that rewards you for predicting which matches will see a goal in the opening half an hour! Correctly select between 3 and 15 matches and you will get fixed odds from 4/1 all the way up to 3000/1! You can’t score too early with 30 Minute Limit at Betfred.com! Did you know… in the opening 10 league games of the 2012/13 Premier League season, more than 50% of matches saw a goal in the opening 30 minutes? Open a new account with Betfred! 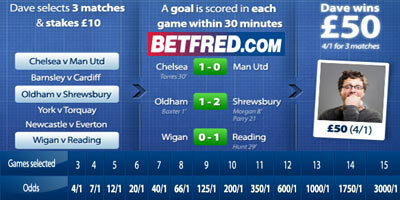 New Betfred's Anytime Scorer coupon: bet on anytime goalscorers! "Win up to 3000/1 with all-new Betfred coupon 30 Minute Limit"